Ireland's best beaches are not a secret, pick a beach any beach at all and feel free to claim it as your own. When my children were young, as well as 'treasure' hunting in castles, we used to go beach 'combing'. It was not unusual to find coconuts (from the Caribbean or fishing buoys from New England) on the West Coast or lumps of coal from Wales on the East Coast. Fortunately, we have never lived far from the sea as is the case with most people living in Ireland. We can proudly boast of having possibly the most spectacular coastline in Western Europe...pity about the weather. There are no ‘costas’ in Ireland (Thank God) however on a ‘pet’ (unseasonably warm) day in May or September, you could be forgiven for thinking you were in Greece should you find yourself on a deserted white sandy coral beach, lapped by turquoise waves with only a couple of cows or sheep to keep you company. Ireland's best beaches on the east coast are much busier due to their proximity to the capital, Dublin city with the added bonus of being able to buy an ice-cream or a coffee close by/ Whereas on the west coast the beaches can be pretty isolated, fabulous if you fancy nudey sunbathing or skinny dipping but be warned, even with the north Atlantic drift warming the water the temperature never rises much above 6C. And of course, never, ever swim alone, it can be very, very dangerous no matter how inviting it looks. There are plenty of Blue Flagged (ie water quality tested beaches throughout Ireland), with lifeguard stations, but only during the summer months. 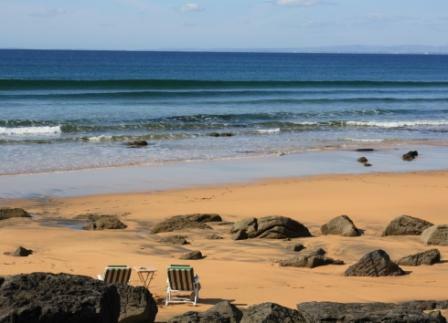 For a list of the ten best beaches in Ireland visit click here.